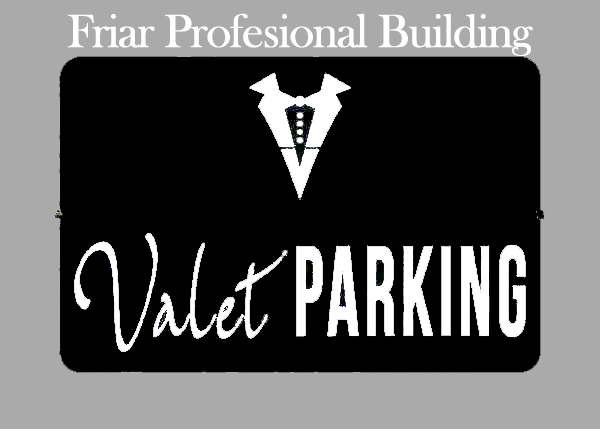 The Friar Professional Building Valet Parking Services. You may also use the valet service at the front entrance of the building. The tenants will validate the parking . The Friar Professional Building Valet is a premier provides services to the tenants and their clients. The Friar Professional Building Valet is an independent entity that serves the tenants and their visitors to the building. They offer exceptional valet parking services, with an emphasis on professionalism and friendliness. We specially chose them for great care in carefully hiring and training their employees, so you can count on working with professional, uniformed, well-groomed valet attendants. Our goal is for our tenants and their visitors the valet service to be a service and an asset. Each one of the professional valet attendants are trained to warmly greet the tenants and their guests, provide assistance with directions, if needed , and treat each client’s vehicle with the utmost care. Parking Information: Be sure to get your ticket from the attendants, and have it validated. Parking Validations: Parking rates below apply to everyone who valets their car. Green Carwash is an independent entity serving the FPB building and is a revolutionary business venture that brings technology, convenience, and the environment to the car wash industry for the first time. Since the 1930’s the world has progressed dramatically. However, the car wash industry has not until the inception of Green Carwash. Our waterless car wash units use 100% eco-friendly cleaning agents and approximately one quart of water per car while clients visit the building.